Hello, all Virtual Reality artists! With so many awesome challenges going on, we wanted to bring it back to one of the most fundamental art forms of all: drawing by hand. What are we to draw, you may ask? Eiji Aonuma, the producer for The Legend of Zelda series, recently stated that he didn’t think Zelda was well-suited for VR. Let’s prove him wrong and let The Legend of Zelda (Nintendo®) be your inspiration for this month’s challenge! In this challenge, we open it up to any virtual reality creation tool. This is including, but not limited to: Tilt Brush, Oculus Quill, Medium, etc. The goal is to re-create a Legend of Zelda (Nintendo®) environment or an environment inspired by the games — no characters required! Imagine what sort of stories are going on in your scene! Go wild! Use this as an opportunity to brush up on your Zelda knowledge, re-play Ocarina of Time, and then draw to your heart’s content! After you’ve recreated your own Windfall Island, tag your art as #VRZeldaChallenge to enter. You can use any VR creation tool that you like. You’ll need a VR headset for this, but there are quite a few options such as, Tilt Brush, Oculus Quill, or Medium. Contestants models must be uploaded to Sketchfab and tagged #VRZeldaChallenge to be considered. The winners will be contacted by Friday, February 17th. I think you mean selling Beta Codes. You are correct, we were confused by this. Thanks for reporting! I wanna participate, but..I’am new in sketchfab. I just have upload my model or I have to make something for to be a “VR Creation”? Hey Victor! 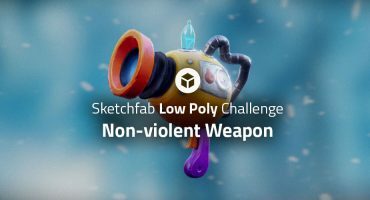 The idea of this challenge is that you use a tool like Tilt Brush, Quill or Medium (tools that work IN VR) to create a game scene. Did you already finish something? I’d be happy to check out your model and advise. Have the winners been announced yet? Would love to see the winning entry! Who are the winners of this competition?